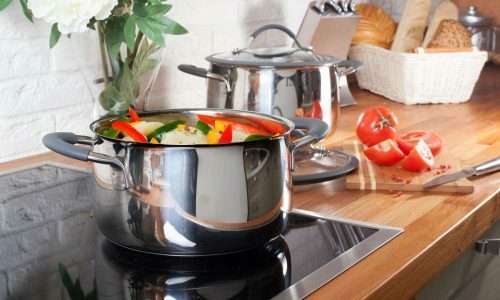 Magma Products developed this very nice set of heavy duty marine grade stainless steel cookware with two criteria in mind. First, they wanted a set that was specifically engineered to give optimal performance when used with single or double induction cookers. Second, they wanted to design pots and pans that would provide RV and boat owners and campers a high-quality, mobile, and durable set with great performance. 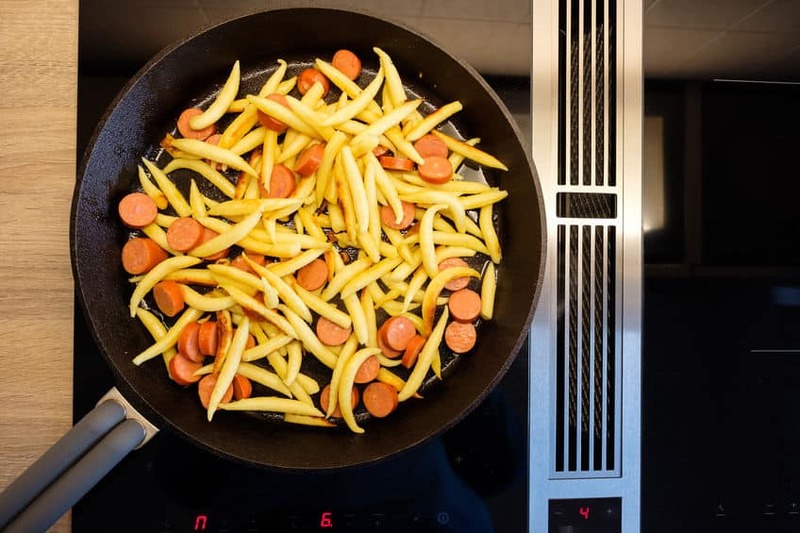 This Magma Products, A10-360L-IND, 10 Piece Gourmet Nesting Stainless Steel Cookware Set, Induction Cooktops can also be used on electric, gas and ceramic cooktops. It is also beneficial for those who choose to live in smaller spaces. These Magma pots and pan are also practical for folks who are short on storage space or prefer nesting cookware. Here we’ll be taking a comprehensive look at this Magma induction ready stainless steel cookware set. The marine grade stainless steel composition alone makes this set well worth considering. Each pot gives outstanding performance on any cooking surface and exhibits intelligent, balanced engineering. The stacking structure of this 10-piece collection of gourmet cookware is highly portable, extremely functional, and attractively designed. the triple clad bottom is composed of interior and exterior layers of stainless steel with aluminum in between. The stainless steel is 18/10 marine grade and carries a mirror polish granting an immediate visual appeal. The heat distribution is superb thanks to the triple clad bottom with an aluminum core which is completely encapsulated. Every aspect of these nesting pots has been designed for portable and durability. The handles are removable and are of sturdy construction. A convenient bungee storage cord is supplied, making it every easy to pack them away securely on an RV or boat. Once they are nestled into each other, the entire 10 pieces take up less than a 1/2 cu. ft. of space. Two stainless steel lids are supplied. One fits the 5-qt stock pot and the sauté pan while the other is interchangeable with the rest of the set. Despite having slight heat retention issues, the lids give a secure fit and add to the attractive design. They lock into place and will not budge, which is a great safety feature. You will also find that the detachable handles carry great durability and are comfortable to hold. 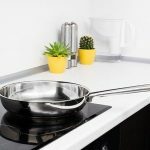 Even though the nesting design of this Magma Products, A10-360L-IND, 10 Piece Gourmet Nesting Stainless Steel Cookware Set, Induction Cooktops has been highlighted, the functionality is truly underestimated. It packs away into a very small area, making it the perfect pot set for those who are limited by space. Even the handles can be packed away into a pot and stored neatly. 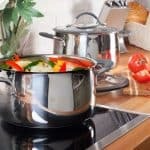 Boat and RV owners will struggle to find a cookware set which is as sturdy and compact and one that can be used with their single portable induction cookers. Even though these gourmet nesting pots have been specifically designed for RV and boat use, they make for a beautiful addition to any kitchen especially those that are space challenged. 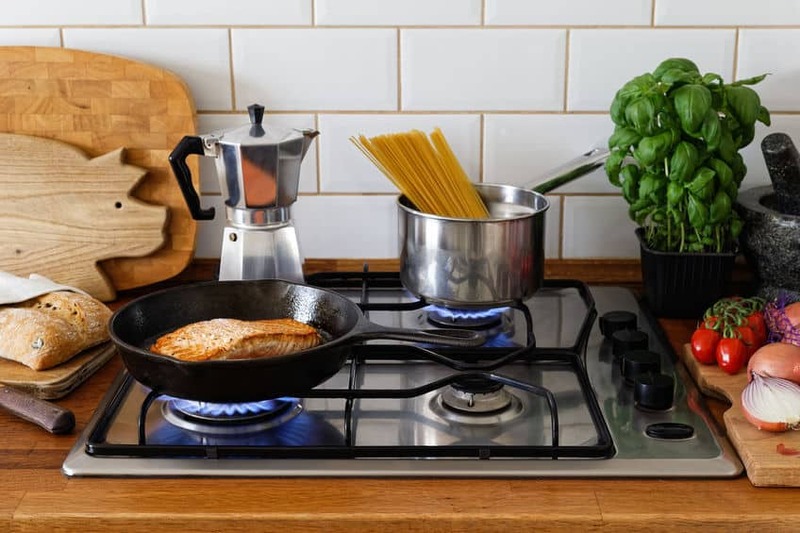 They work on induction cooktops as well as conventional stovetops. 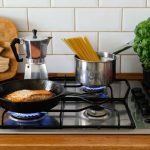 If you are an outdoor enthusiast, recreational vehicle owner, the new purchaser of an induction cooktop, or one who has limited storage options, then this set is worthy of your consideration. Few cookware sets in this price range match the durability, performance or the portability. 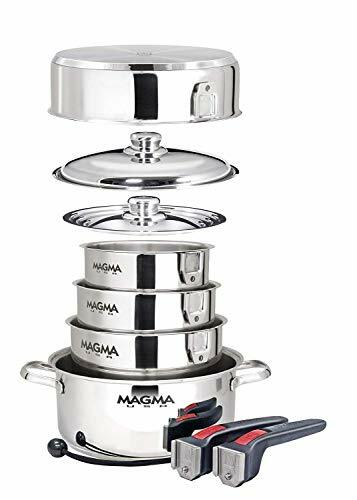 If you would like a smaller set (and thus less heavy), then the Magma Products, A10-362-IND 7 Piece Induction Cook-Top Gourmet Nesting Stainless Steel Cookware Set is a viable option.